Let’s face it. If you write poetry, your craft depends just as much on practicum as it does on ideas. When you’re lacking one or both these elements, attempting to generate a new poem can feel a little Sisyphean…or like moving through a swimming pool full of cement…or…well, pick any metaphor you like, but you get our point. Remember when we told you to ignore the well-intentioned “your first drafts are crap” advice and to temporarily send your inner critic packing? Both points are always salient when creating new material, but in this post, we’re offering a couple of tips to help you get your poetry brain unstuck. Do You Need to Shift Gears? Neurodivergent brains all operate in unique ways, but your mental processes to create poetry might drastically differ from your fiction-crafting methods. If you’ve been focusing on short stories or a novel, it may just be a matter of “shifting” into poetic mode. Keep in mind, however, that lines between genres can easily blur. You may reread a 300-word piece you just finished and wonder whether it’s a long micro-fic or a prose poem. That’s a grey area, one in which you’ll make the final call when it comes to genres and classification. If you don’t write every day or you’re a professional writer generating specialized types of content, you may not be creating poetry on a daily basis. Rather than stare at a blank page and struggle, now may be the time to suspend your “logic brain” and stop making sense. Try freewriting sans prompt, letting whatever is in your mind leak out. You’ve probably heard of “stream of consciousness” writing, and yes, that’s the idea here. Also, this isn’t the time to worry about subject-verb agreement or whether your first draft even makes sense. In fact, if it doesn’t make sense at first, that could open a door to fashioning a new work you might not have otherwise created. You’ve heard the oft-repeated advice that writers need to read. Of course, we at AutPress are happy to help with some suggestions. If you love genre-blending or hopping between genres, Ada Hoffman’s Monsters in My Mind is a great addition to your collection. It’s packed with 49 pieces that include short stories, flash fiction, microfiction, poetry, and prose poems, spanning universes of speculative fiction and plunging deep into the human imagination. We’ve also got more poetry, weird fiction, and more in the AutPress store. Autistic readers perennially find themselves encountering literature that isn’t crafted from an autistic-centered point of view. On a yearly basis, we’re continually bombarded by books about autism written by parents of autistic children that either perpetuate harmful beliefs or disrespect their children in horrifying ways, failing to recognize their rights to privacy and personal agency. “To Siri with Love” by Judith Newman is the latest offender to make the rounds, but even books by so-called “experts” and journalists, such as “In a Different Key” don’t do the topic justice. Fortunately, Autonomous Press is committed to offering solid alternatives written by autistic people. Who better than autistic individuals to talk about their brand of neurodivergence? The Real Experts is an anthology about autism, with essays written by autistic folks from a wide range of backgrounds. The collection includes words of wisdom from respected activists like Kassiane Sibley and Amy Sequenzia, educators such as Nick Walker and autistic parents like Morénike Giwa Onaiwu. As one of the first wave of books released by AutPress, it’s evidence of one of our core fundamental beliefs: neurodivergent people should be the ones to craft and control the narratives of their lives. Author Verity Reynolds describes their debut science fiction novel Nantais as “autistic as heck,” but the real genius behind the book is that the word “autism” never appears anywhere in its text. Instead, Reynolds shows rather than tells (which one of the fundamental tenets of masterful storytelling, after all) characters “interfacing autistically with a non-autistic world,” as they put it. Want to know the best part? Besides Nantais being an action-packed space opera full of slavers, biologically-evolved assassins and the dark underbelly of a supposedly legitimate organization being exposed, it turns the typical tropes on their heads, giving us a universe in which non-autistics are the ones “suffering mind-altering self-consciousness over their own vague-meaning, innuendo-stuffing” style of communication. Need some post-holiday reading to curl up with? With our 101-style books like The Real Experts and science fiction thrillers such as Nantais, AutPress has exactly what you’re looking for. Feed your need to read by shopping for these and our other great titles in our AutPress store. So you want to craft some fiction or poetry and you’ve got ideas brewing, but you’re struggling with how to get them out of the concept stage and onto the page. Maybe you blew through 50,000 words (or more) this past NaNoWriMo and you’re feeling some serious brain drain. Thankfully, we’ve got some tips to help you jump-start your creativity. If you’re contending with a wicked case of writer’s block or just need a little extra nudge, try our advice to help the ideas pour out of your head. There are times where you need an honest eye to review the fiction, poems or other work you’ve already generated. Married with a willingness to “kill your darlings” (yes, we know you’ve seen that phrase A LOT, but stay with us), the two can serve as a powerful combo to help you revise and refine down to your best work. However, those aren’t the tools you need while you’re furiously trying to channel your ideas from the amphitheater of your mind to a blank screen. “red-flag” every word choice, image or piece of dialogue in your fiction, or every line break, metaphor, simile or rhyme in your poems. The first draft ISN’T the time for perfect; it’s the time to bring your ideas into reality. You can do the other hard work of revising and rewriting later. Seriously. The famous axiom that one’s first draft is always “crap” is usually attributed to Hemingway. Whoever said it probably wanted to either 1) emphasize the importance of revision or 2) drive home the point that whatever you put down first doesn’t have to be perfect. Well, guess what? Whether it’s novel-length fiction, poetry, short stories or anything else, the very first things you write will be imperfect. But that doesn’t mean they’re crap. Maybe you’ve had a well-meaning fellow writer parroting the idea, or a writing instructor insisting it was gospel truth. (We’d like to give that instructor a piece of our minds, but we digress.) Right now, it’s time to forget that “helpful advice.” Let your fingers fly over the keys or the page. Think of that output as simply the rough and unpolished beginnings of something beautiful, with raw potential living inside the text. We offer this advice to help your first drafts take form in the here and now. Stay tuned for more writing tips, and don’t forget to check out the AutPress store’s latest releases like Verity Reynolds’ Nantais and Ada Hoffman’s Monsters in My Mind. In Part 3, we talked about the who and why of promoting your first book. In Part 4, we’re going to talk about the what and how. No one author marketing plan fits every author or book. The audience you want to reach and how you want to engage with them, based on your own personality and preferences, are unique to each author. This means that, to make your marketing both effective and enjoyable for you, you’ll want to choose a mix of tools that you enjoy working with. Every author should have a basic web presence as a part of promoting their first book, whether it’s an Amazon or Goodreads author page, a Facebook page, or a simple website bio. Curious readers are likely to look you up online, so make sure they can find you (and find how to buy your book) when they do. Some authors, however, go much further. Regular blogging can help you build a community. Many authors love Twitter for its fast-paced, constant-conversation approach. Several authors even create their own podcasts or YouTube channels in order to connect in a more personalized fashion. Think about the audience you’ve envisioned for your book when deciding when, where, and how to reach out to potential readers in person. An added bonus of either of the two approaches above: they can often be used to make money on their own, in addition to promoting your first book. For example, blogs can be monetized through ads or product promotions, or you can encourage donations to your work through tools like Ko-Fi and Patreon. Give enough presentations on writing, and pretty soon you’ll be able to charge a fee for your presence – or at least be able to ask the venue to cover transportation and expenses. Monetizing your promotion is part of becoming a professional author, not merely a writer. It takes time – but thinking about how to do it in the early stages can help you prepare to seize later opportunities. Nearly anything you do to share your book with potential readers counts as “marketing.” To use your time and energy best, however, it’s good to have some kind of author marketing plan. Your plan will help you stay on task and focus your efforts where they’ll offer the biggest return. If the words “marketing plan” make you want to quit writing altogether, don’t worry. Creating a plan isn’t as tough as it sounds, and we’ll cover what needs to go into your strategy in the next few weeks. Who will like or appreciate your book the most? What do they like to read, watch, or listen to? Your audience’s interests will guide nearly every aspect of your author marketing plan, so it pays to understand what inspires them. 2. What makes your book worth reading? Write several one-sentence descriptions of your book that would make you want to read it, even if you had never heard of it before. Keep working until you have 3-5 descriptions you like. This exercise helps you see your book from the perspective of a reader. It helps you zero in on what’s most compelling about your book and what sets it apart. And it generates ideas that can form the basis of your book blurb, author bio, or other author marketing plan elements. Finally: What makes you, the author, worth getting to know? What are your best qualities? What do you love sharing with other people? Many readers these days are less interested in books than they are in following authors – and many authors capitalize on this fact by building strong social media or in-person followings. Build your own strengths into your plan so that marketing becomes something you enjoy doing, not something you have to do. We sat down with Ada Hoffmann, author of Monsters in My Mind, to talk about speculative fiction, the state of the writing world, and what’s next. AutPress: Why MONSTERS IN MY MIND? Why speculative fiction generally, and why this collection? Ada: I grew up around speculative fiction. It’s a childhood love, and one of those things that was always there. Literary realism never felt grounded to me – it felt small, stifled. Consciously cut off from all the realms of imagination that could have been. I’ve been publishing short speculative fiction and poetry since 2010. Short fiction is a delight to me – I probably read more of it than novels. I’ve also written a lot, and I wanted to make that writing tangible. A physical object that I could hold in my hands and give to people. I organized MONSTERS IN MY MIND around a loose theme appropriate to NeuroQueer Books – the theme of being different, monstrous, or out of place, and hoping to somehow be accepted that way. I grouped stories and poems so that they moved through different ways of engaging with that theme in a way that felt, in a very abstract sense, like its own story. A few short works I loved didn’t make the cut, not because there was anything wrong with them, but because they didn’t fit into that “story”. Maybe they’ll go into a future book! As for the title, I don’t remember where I got it, but it happened fairly late in production. I’m not the first person to have used the phrase. If you want to assume cryptamnesia, then it probably comes from the song “Happy Hurts,” by Icon For Hire. AutPress: What are some of your favorite sources of inspiration? What/Who else do you read or recommend? Ada: Sometimes ideas just happen. It isn’t glamorous. “You Have to Follow the Rules” was based on a dream that my friend A. Merc Rustad had. “The Chartreuse Monster” came partly from a random number generator. “Centipede Girl” was inspired by an actual centipede that crawled on my keyboard, and “The Mother of All Squid Builds a Library” was based on a list of tropes that another friend of mine liked. One of my best ways to generate ideas is by going to a classical music concert, where I’m forced to sit in a chair for two hours, listen to pleasant noises, and let my mind wander. And my go-to method for coming up with more poetry is just to binge-read any poetry at hand until my mind starts automatically arranging its thoughts into verse. In terms of other authors who inspire me, Catherynne M. Valente’s collection “A Guide to Folktales in Fragile Dialects” was the reason I got serious about poetry. Meda Kahn’s short story “Difference of Opinion” pushed me to be better and braver about autism representation. I would love one day to build worlds like China Miéville, develop characters like Lois McMaster Bujold, dispense careful wisdom like Rose Lemberg, build up a sense of scale like Robert Charles Wilson, quip and twist the plot like Joss Whedon on a good day, and tap into the depths of my id like Tanith Lee. Anybody wanting more of the queer and neurodivergent themes from MONSTERS IN MY MIND should check out A. Merc Rustad and Bogi Takács, among many others. AutPress: What’s the most unexpected thing that happened while you were working on this collection (or any particular part of it)? Ada: Once I had all the stories, putting the collection together was pretty straightforward. Though – one unexpected thing that happened while the collection came together was that I landed an agent for a novel I’d written. That was very distracting, in a good way. AutPress: Where is spec fic/dark fic/weird fiction headed? What does it need more of? Ada: I don’t think spec fic will ever go in just one direction. It’s a big tent with a huge number of things going on. It’s clear, though, that at least some parts of spec fic are moving towards more diversity and better representation. There’s an increased interest in diverse characters, in diverse authors, in concepts like #ownvoices – and also in the range of new ideas, not just writing about themselves, that marginalized authors bring to the table. I’m really enjoying all the recent counter-Lovecraftian fiction, for instance. Silvia Moreno-Garcia’s Innsmouth Free Press was doing this for years, but now it’s been joined by some higher-profile friends: Ruthanna Emrys’s “Innsmouth Legacy” series and Victor LaValle’s “The Ballad of Black Tom”, to name two. Of course, this trend comes with pushback; you don’t need me to tell you the story of the Sad Puppies. It would be naive, especially in 2017, to say that things will clearly keep changing for the better. But we’ll see what happens. AutPress: What are you currently working on, and what’s next? Ada: Well, my agent is shopping my novel around, and I’m replenishing my store of short fiction and poetry. I’ve written some really daring short pieces that I’m very excited to share when they find a home. Two collaborations that I love are coming out in the next year or so – one with Jacqueline Flay in Persistent Visions, the other with A. Merc Rustad in Lightspeed. I’m also working on a collection of dinosaur poetry called “Million-Year Elegies”. That’s about 75% done, and a few early pieces from that series are already published online, if you want a teaser. Of course, I’m also still working on my PhD research, in which I teach computers to write their own poetry. My biggest challenge is finding time for all these projects and book promo, too! Visit Ada Hoffmann online at http://www.ada-hoffmann.com. Pick up a copy of Monsters in My Mind on Amazon or via the AutPress store. Both first time writers and established authors like to dream of a world where we don’t have to do our own marketing. We’d all love to do nothing but write, mail the occasional manuscript to our editor, and watch the accolades (and the royalty checks) roll in. In our dream world, publishers market writers; we just write. Here in reality, many publishers do promote their own writers. The Big Five do it with big budgets; independent publishers like AutPress do it more strategically. But every author, large or small, promotes their own book – at least if they want it to sell. Rowling’s publishers have plenty of money to support her marketing efforts, which is how Rowling produces lush interactive websites like Pottermore instead of your average author blog. But Rowling is also active on Twitter, where she’s as well known for her political wit as she is for talking books. Stephen King has produced approximately one book a year since the 1970s; Google’s answer to “How many Stephen King books are there?” is “At least 107.” There’s no doubt that King works with a publisher that promotes its own writers. But King promotes his own work as well. He’s active on Twitter and still does public appearances. He also promotes his books by writing more books: On Writing, published in 2000 (and released again in 2010) encourages new readers to pick up King’s books by offering a bit of insight into how they were written. Yet another writer who loves Twitter, N.K. Jemisin uses the platform to connect with other writers, share publishing news, and tweet images of her adorable cat, in between writing bestselling books. Jemisin has also leveraged Patreon’s creative platform, where the support of her patrons has put her well over her original monthly income goals. To give your own book its best chance to be read and loved, it’s important to choose a publisher that promotes its own authors. But it’s even more important to choose your own promotion approach. No matter how famous your book becomes, you’ll need to market your own work. Very few writers daydream about becoming their own marketing point person. On the list of exciting things that might happen after you complete your manuscript, “author marketing” might rank near the bottom. In order to succeed, though, you need to do what every successful author does: take the lead on your own marketing. Over the next few weeks, we’re going to show you how to do just that. First, though, we’re going to answer a burning question: Why do you need to promote your own book? 1. No one knows your book like you do. You’ve lived with the world of your book for months or even years. You understand what’s going on, why it exists, and how it operates. While a professional promoter or your publisher can help you place promotional materials in front of the right audiences, the most compelling promotions are going to come from you. 2. People like to put their money where their friendships are. “Author marketing” isn’t just about an author promoting their own book (although that’s a lot of it). It’s also about promoting yourself: as an author, as a source of fun and creative ideas, and as a person. About 350,000 books get published each year in the U.S. alone. Most of us only hear about a fraction of them, but we definitely hear about the ones our friends and acquaintances write. By building a strong following, you expand your “friends and acquaintances” circle – thus expanding the circle of people who will line up to buy your book. 3. Promoting your book will make you a better writer. Try this writing exercise: Imagine someone else wrote your book. Generate 3-5 one-sentence descriptions of it that would make you pick it up and read it. Not easy, right? But a lot of fun. Marketing your book gives you a different perspective on the work. It demands that you write in different ways. And in doing so, it sharpens your own writing skills. If author marketing feels like a total mystery, don’t fret. As a publisher who markets our writers and teaches them to market themselves, we’re going to break down the details for you over the next several weeks. Stay tuned! They say that if you want to succeed as a professional writer, you need to read. It sounds like simple advice, but it’s true. Specifically, you need to read what is fresh and new, as well as what will give you an idea about the history of the style you are developing and working in. For writers who don’t always embody the traditionally cultivated image of a writer in American publishing, it can be hard to find role model writers. Historically, disabled writers, mentally ill writers, and even writers of color have found themselves erased from mainstream publishing. Luckily, there are a number of independent venues that have always served to help elevate diverse books. Traditionally, these include important presses like Grove, as well as daring university presses like the one out of Duke. In today’s electronic landscape, both writers and readers are clamoring for diverse books, and a new generation of writers is growing up demanding stories about people like them, by people like them. That’s why Autonomous Press and Neuroqueer Books have expanded our search for diverse writers. If you’re looking for a gift for a reader who wants to see both diversity and depth of storytelling, you need to check out the package discount on our Spoon Knife series. Between the two volumes, over 60 writers with a diverse range of backgrounds tell stories of neurological divergence and queerness. There are also deep discounts on The Puzzlebox Collective’s Shaping Clay series, following the exploits of an autistic transgender girl as she comes to terms with the need to keep her identity hidden from everyone around her. Lovers of poetry will find Barking Sycamores a treat, and you can easily tip them off to the free reading on the blog before surprising readers with the collections, available now on the Autonomous Press site. Of course, Christmas isn’t the only time readers need new books, so it might be worthwhile to add yourself to our mailing list today. Mailing list subscribers get access to great discounts not available elsewhere, including 20 percent off new release coupons, bundle clearance deals, and more. Order soon! You’ll want to get your order to our store by 12/14 to make sure we can get you books by the holidays. Short fiction has gotten the short end of the stick for much of its existence, despite the fact that it is perennially popular with critics and prize committees. While there are a number of short story artists who have forged a career in the form, many publishers shy away from volumes of short tales unless they come from an established writer. Fans of weird fiction, slipstream, speculative fiction, and horror realize the problem with this, though. So do fans. In an age where a number of writers are choosing to make their careers in short ebooks first, publishers need to sit up and take notice. That’s why Autonomous Press has worked to invest in poetry and short fiction. We want to help a large number of fresh new voices find their audiences, and we want to connect the ways that readers and writers interact in this digital age to the distribution that makes it accessible to a wider reading community. That’s why we started the Spoon Knife series, and it’s why we started cultivating short works from individual artists. We’re still just starting out as a company, but we have already managed to bring a couple of wonderful books by individual writers to the market, including Fable the Poet’s initially self-published chapbook. Fable is currently the poet laureate of his hometown, Grand Rapids, Michigan, and his insightful characterization and frank discussion of topics like trauma, race, and mental health provide readers and listeners with a unique point of view that flows like music. 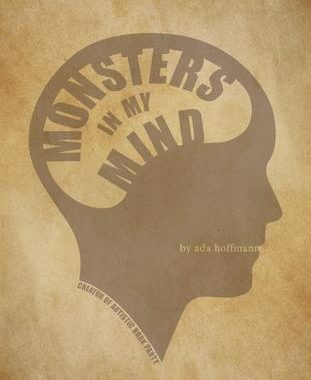 For those in traditional genres looking to devour short tales that are a little less directly reflective of everyday life, we have Ada Hoffmann’s Monsters in My Mind, which brings together over 40 strange tales that span horror, fantasy, science fiction, speculative fiction, and more. These are never before published works, and you can find more notes about each one on her blog. Whether you are looking into our anthology series, the collection of work curated through Barking Sycamores, or these individually authored books, you are going to find that AutPress has taken steps to make NeuroQueer Books a place for unique points of view. We’re looking forward to bringing you more of that in the new year with additional volumes of Barking Sycamores and Spoon Knife. Until then, check out Ada’s book, as well as the new novel by Verity Reynolds.